Indian Oil Corporation Limited (IOCL) has issued a notification and sought applications for 390 posts. Applications will be made for the posts of Technician Apprentice / Trade Apprentice through this recruitment process. Before applying the interested candidate, download the notification from the official website of IOCL so that all information is filled properly. Candidates can apply online for this examination before October 12. Candidates can apply online by visiting the official website of Indian Oil Corporation Limited. Before applying, the candidate should keep in mind that the application is filled only on the basis of the facts given in the notification. Pay Scale: Candidates will get monthly salary of Rs. 7530 / - per month. Candidates will be selected on the basis of written examination / skill test / interview. See the candidate's notification for the academic qualification. 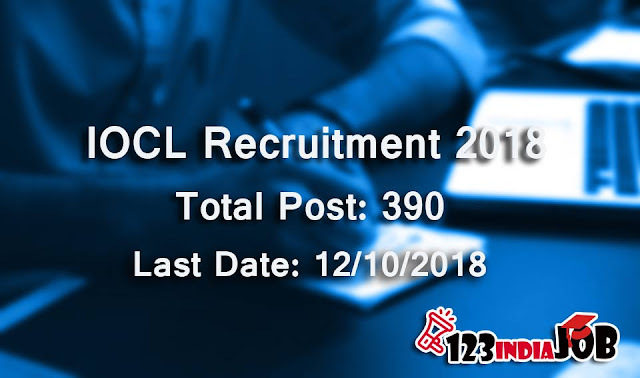 Government Jobs In India -Bank Recruitment In India- PSU Jobs In India, Find the Best Jobs in 123indiajob.com all indian governmen jobs, sarkari naukari, Bank jobs, public jobs, private jobs, university jobs.